I’m reading a book about getting high without drugs or alcohol. Ironic, because I live in the heartland of hedonistic, exquisite, gourmet highs, sipped, smoked, or tasted: Sonoma County. In the midst of an opiate epidemic– understandable within our current mutated, obscene American political climate– I think we have lost our ways of enjoying the old ways of getting high, all on our own, in our own brains and bodies. The Book of Highs, from my library, with four charming blue eggs, from my Coturnix quail. 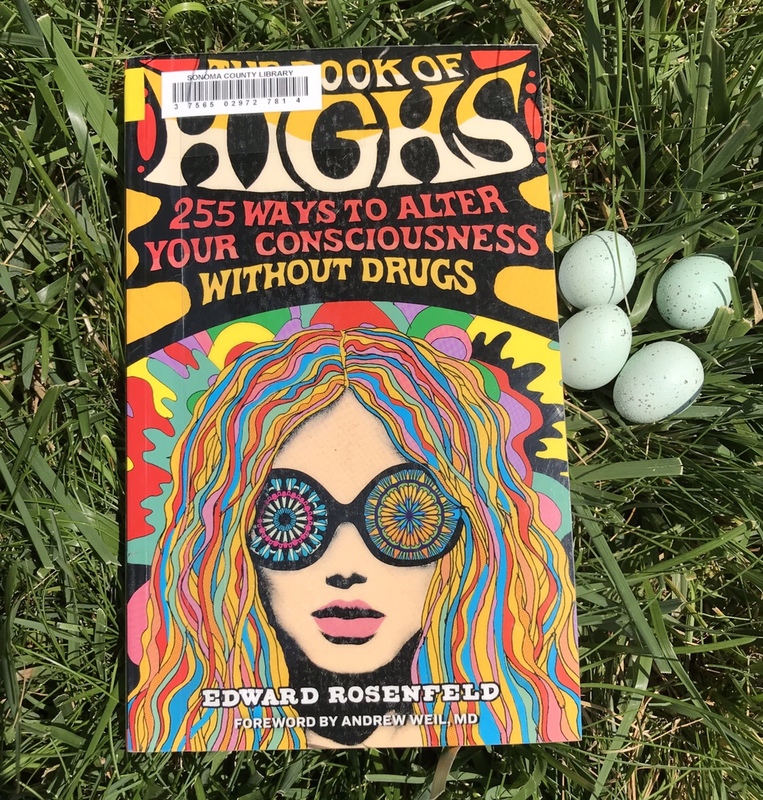 The Book of Highs: 255 Ways to Alter Your Consciousness Without Drugs, by Edward Rosenfeld, is an likeable little compendium and pretty fun to read. Written as a list, and illustrated with pop psychedelic-toned graphics, I immediately turned to the segment “Creativity: Reach into yourself, find and make something new.” The quotes are all from this book. I found this striking. In trying to teach students to paint intuitively this summer, I found that the concept is very hard to explain. It doesn’t mean that there is no selected form, no restrictions. It also doesn’t mean that you can’t alter it, edit it, find it wanting, or judge it. If it exists in the physical universe, there is always something that restrains and limits the painting: the canvas and brushes, perhaps a chosen color palette or emotional feeling. It’s this act of intuition that gets you high. It is exhilarating to watch forms appear from nowhere. One thing to note is that you have to use it, not just observe it. It isn’t a movie, and it’s not an opium dream. If Coleridge hadn’t written down the lines of Kubla Khan before the “man from Porlock” had knocked at his door, we would not have an amazingly strange and evocative poem, but just another lost drug hallucination. We tend to focus on the lost world, the longer poem or epic that vanished when Coleridge was interrupted. Why not celebrate what he did manage to capture? I was talking to a novelist who recently visited my studio about characters in his novels who seem to live their own lives, independent of his best writerly plans for them. He said that a master writer once told him something to the effect of “give the construction of your novel to your characters. They’ll do it for you.” I try to give the construction of the painting to the intuitive impulses that manifest: shapes, lines, colors, sometimes spirits or ideas. This intuitive painting process makes me high. It’s a problem. I can’t drive when I’m painting; ask my husband. It also makes me useless for a while for everyday life and chores. It takes a lot of energy as well, and there can be a big low after the high of creation. Salt, the final painting, to the far right. But I’m now an addict. I couldn’t live without the creative high. Creation is our agency to make change, and it gives us back unimaginable pleasure in return, if the risk is taken.